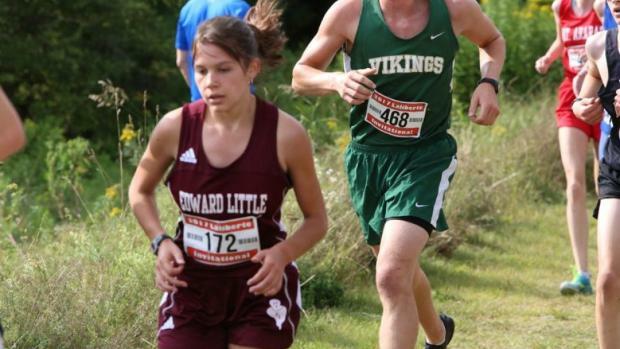 Edward Little's Jillian Richardson has taken her running to the next level this fall, and on Saturday at the KVAC XC Championship she continued her excellence with a dominating victory. She finished 1:05 in front of the Class B winner Molly McGrail of Maranacook. She executed her race plan to a tee opening up a 10 second lead over the field at the mile, and then blowing it wide open during the second mile hills. Despite the cool rainy conditions which made the course soft and muddy in places, the senior clocked the third fastest time in course history with her winning effort of 19:27.8. She improved her time from earlier this fall by 19:37.97 which was run in ideal conditions. A year ago Jillian finished third in this meet running 20:22. Looking ahead to the state meet Richardson said "Just looking to run a PR, and finish strong." If Saturday was any indication she'll be strong enough. While Richardson did her thing there was some strong racing going on behind her. The Mt Blue duo of Kahryn Cullenberg & Emma Charles led the Cougars with a 2-3 finish. Cullenberg continued her strong running clocking 20:37.4, a 6:38 mile average on the tough course. She had the third fastest time of the day, improving on her 9th place 21:42 effort from a year ago. Meanwhile Charles crossed the line behind her in a time 21:02.1 holding off senior Augusta Stockman of Camden Hills the runner-up last fall by just .01. Senior Peyton Arbour of Messalonskee was next across the line in 21:07.9, she was followed by freshman Elsie Hildreth of Camden Hills (21:12.2). Mt Ararat's sophomore Camila Ciembroniewicz placed seventh with her 21:16.4 performance, she was followed by three other sophomores Claire Wyman of Camden Hills (21:18.3), Olivia Mosca of Brewer (21:31.4) & Charlotte Wentworth of Messalonskee (21:34.9). On the team side Camden Hills repeated as team champions as they tallied 48 points to easily outdistance runner-up Mt Ararat by 42 points. Mt Blue was third with 122. For the Windjammers even without 2017 star Grace Iltis sidelined, they place three harriers in the top 8 finishers en route to a team average of 21:33.46.